According to Gartner, two out of every three organizations that have an MDM tool in place are not satisfied and looking to leave. Are you one of them? Whether your current vendor doesn’t provide the support you expect or you simply require a more robust tool, switching MDM providers doesn’t have to be overwhelming or painful. 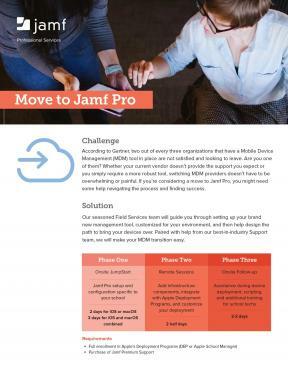 We’ve helped thousands deploy, manage and secure their Mac, iPad and Apple TV devices and can take the uneasiness, time constraints and project management overload out of moving your data from your current solution to Jamf. Read the PDF to learn more and contact us when you're ready to get started.